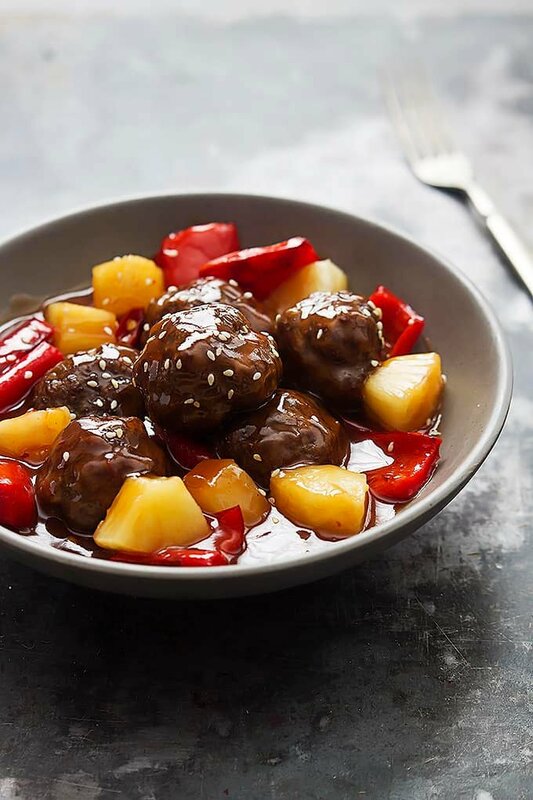 Saucy Asian Slow Cooker Sweet & Sour Meatballs with red peppers and pineapple made right in your crockpot! Helloooooo! Happy Sunday folks. I know you’re dreading going back to the grind tomorrow, but take comfort in knowing that you’ve got a new totally yummy dinner on your menu and it is all of the things a weeknight dinner should be. These also make a crowd-pleasing appetizer. 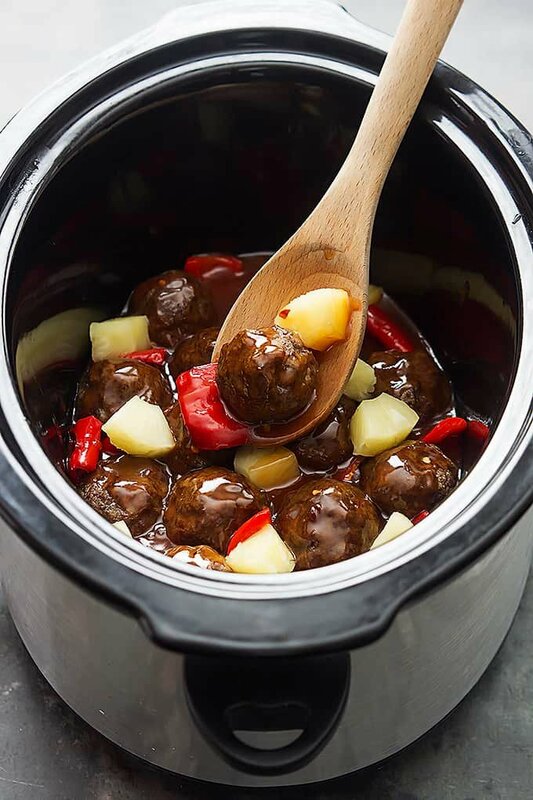 So if you’re planning a weekend get together and wondering what you can make that will not require a lot of work and will knock the socks off of your guests, slow cooker sweet and sour meatballs are your answer. In fact if you’re making them for an appetizer, I’d make them a little smaller than usual and they will be little meatball “poppers” – perfect for the whole toothpick-serving method. My favorite part of this whole thing (besides that it is made in the slow cooker which is basically my #1 cooking method of choice…) is the sauce for these meatballs. I created it for my healthy sweet and sour chicken recipe and I can’t part with it. It’s sweet – but not overly sweet – tangy, and if you add a few crushed red pepper flakes, it gives the sauce a teeny tiny kick, not real spicy, just a bit of edge. In fact I love this sauce so much I wish they would serve it in all Asian restaurants because it’s 10x better than anything I’ve ever been served with my cream cheese wontons that’s for sure. I think most takeout versions of sweet and sour are way too sweet. This recipe: perfectly sweet. perfectly sour. gah I just love it. And just for all of you non-slow-cooker people (you be crazy! but I love ya) I included a special set of directions in the ‘notes’ section on how to bake these meatballs instead. 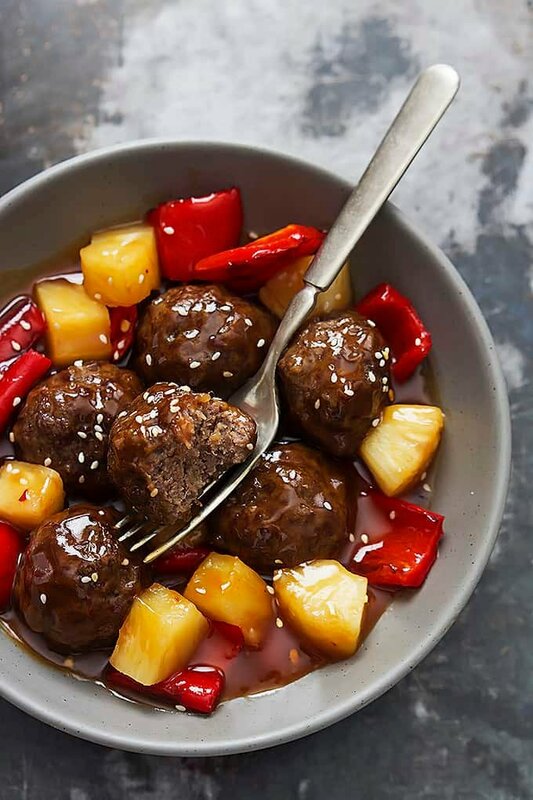 Saucy sweet and sour meatballs with red peppers and pineapple made right in your crockpot! In a large bowl combine ground beef, egg and yolk, breadcrumbs, salt, pepper, garlic powder, and onion powder. Use your hands to mash everything together until the ingredients are well-mixed. Roll the mixture into 1.5 inch balls. 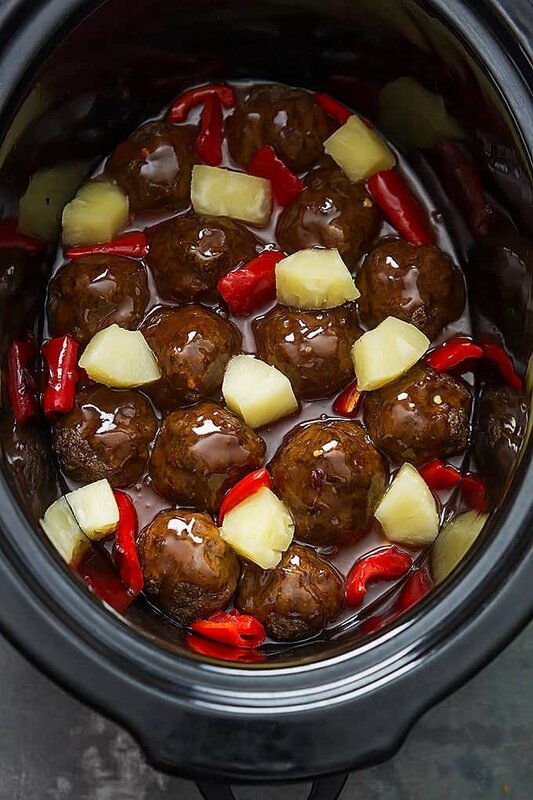 Place meatballs side by side in a single layer in the bottom of a greased crockpot. Add pineapple chunks (without juice) and red peppers. Prepare the sauce by whisking together sugar, apple cider vinegar, soy sauce, garlic powder, onion powder, ketchup, and red pepper flakes in a bowl. 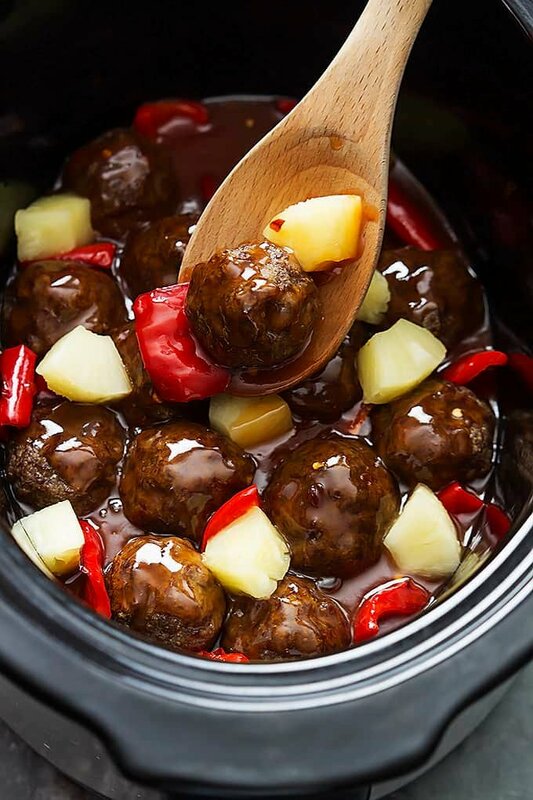 Pour over meatballs in the crockpot. Cover and cook on high for 1-2 hours or on low 3-4 hours. About 30 minutes before serving, in a small bowl whisk together cold water and corn starch. Pour into crockpot and stir. Cover and allow to thicken for about 30 minutes before serving. Sprinkle with sesame seeds if desired. 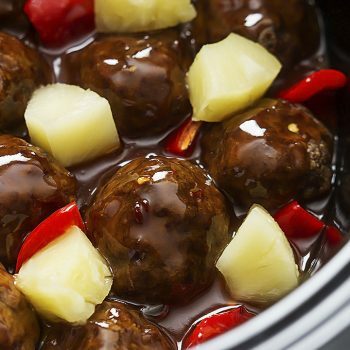 Alternate oven cooking method: instead of placing meatballs in the slow cooker, place them on a greased baking sheet along with the chopped red peppers. Bake them for 15-20 minutes until cooked though and browned. Remove from oven and add to a large sauce pan with your sweet and sour sauce, the cooked red peppers, and the pineapple chunks and stir over medium heat. Add the corn starch slurry and allow to thicken for about 5 minutes before serving. Sauce recipe adapted from Healthy Sweet & Sour Chicken. Mmmm I could drink that sweet and sour sauce! It’s so good! AGREED! I have a habit of getting obsessed with sauces – one can never have too much sauce!!! Im a little confused with The recipe it doesnt say where you add the sugar. Could someone please help me. Thanks for pointing out that typo! It’s fixed- it’s included in step 2 with all the other sauce ingredients. Could you make this with frozen meatballs and just add in the sauce on top of those? Thanks! These meatballs look amazing, and I’m so impressed with how gorgeously you managed to photograph them! The sauce looks increeedible. Oh my gosh thank you that’s so sweet!! We tried it and was easy to cook and delicious! hi Tiffany, I stumbled upon on your site by mistake around 10 pm a few nights ago( just browsing) and was so pleased with your dessert recipes especially the (caramel apple pound cake) I made it.lol.. it was devine. .then I saw your slow cooker sweet and sour meatballs and i made them as well… they are in the crock pot right now, I will let you know how they turned out,im sure its a keeper.anyway the thing I wanted a point out to you is on the meatball recipe when you scroll down to sauce it calls for 3/4 cup sugar , but then the sugar is no longer mentioned into the rest of your ingredients it definitely was an oversight im sure,but I wanted you to be aware ….thank you so much for sharing your recipes , and much success in your future endeavors with your web site .I love it . This is the second dish i have made from you OMG this was sooo good. I am so glad you enjoyed it! This is one of my favorites – the sauce is so yummy I like to double it and pour a bunch over rice! This looks awesome but I’m confused about the amount of ground beef. One or two pounds? One and a half pounds? Please clarify. Thanks. I can’t wait to try this. These and the cheese stuffed meatballs look delicious, but I haven’t been able to pin either recipe. The message says it will lead to spam? I couldn’t see the whole message. Hi Vicky – Pinterest is having an issue but I’ve been in contact with them and am hoping it will be resolved today! Thank you for your patience! Hi Tiffany, Would you please specify about the amount of ground beef and the amount of ingredients? Do you still use 1 egg and 1 egg yolk whether you 1lb or 2lbs of ground beef? Same with the sauce, do you use the same amount of sauce or do you double it depending on the amount of meatballs? Thanks!! Great recipe! I tweaked a bit, using fresh onion and garlic instead of powder and brown sugar instead of white. Loved finding a recipe for slow cooker meatballs with fresh meatballs instead of frozen ones! 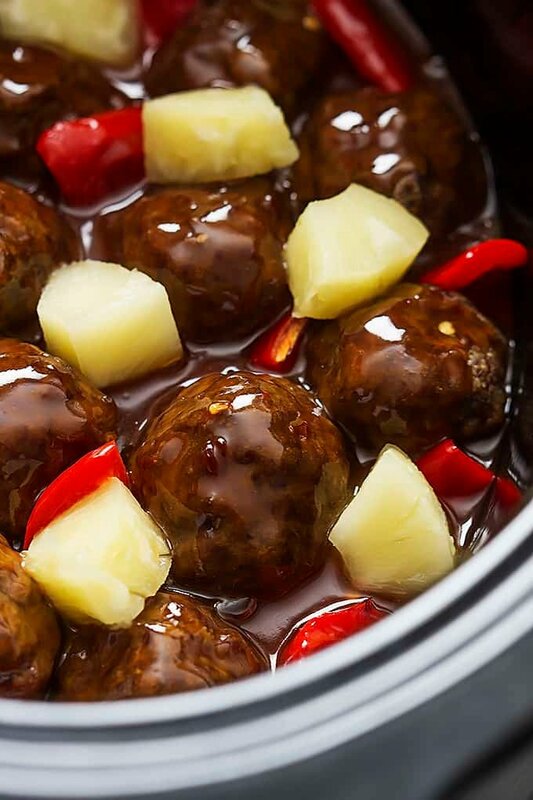 Just tried your sweet & sour meatballs, for a luncheon in the morning! I loved the sauce! My hubby loved the sauce! Can’t wait to share tomorrow, Bravo!!! Finally a sweet and sour sauce I enjoy 🙂 I’m not much of a sauce fan, especially s&s, but my husband loves the stuff, so it’s always a bit of a challenge when have Chinese. This recipe hits all the right marks, tangy with a touch of sweetness and heat from the pepper flakes. Using frozen meatballs made this such an easy recipe to make. I will be making it a lot this summer when we are at our cottage. Thanks! These are so delicious! I make them about once a week and my whole family loves them. I’ve even started to freeze them (without the sauce) for a fast meal later. They are very good and pretty easy to put together! Thank you for the great recipe! Great recipe. Easy preparation an wonderful results. I’ve made these a couple of times and they were the hit of the party with numerous recipe requests. Try adding just a few drops of sesame oil to the sauce. I think it adds a little TO what is already a fantastic sweet and sour sauce. Hi Tom! Thats a great idea with the sesame oil- it sounds delicious! I am happy that you (and so many of your friends) have enjoyed this dish!! 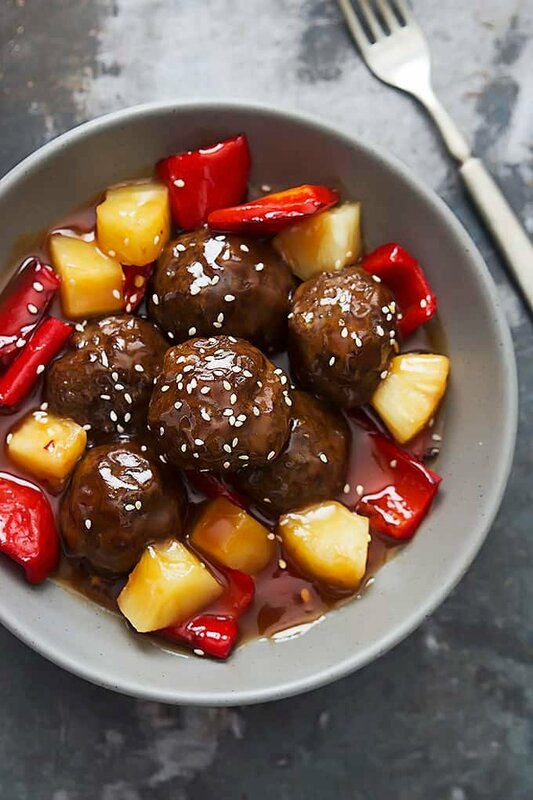 Made this sweet and sour meatballs for a new year’s eve appetizer and it was a huge hit! Thank you! super easy and very yummy! Thank you! Sounds like the perfect appetizer for a new year’s eve party if you ask me!! I am excited to hear that they turned out great for you! I don see an anwser regarding the amount of ground beef. If we only use one pound, will the recipe still be the same? It just seems that there is quite a difference b one and two pounds of meat. cOULD YOU SUBSTITUTE HONEY IN PLACE OF THE SUGAR IN THIS RECIPE? I haven’t tried this myself but it could possibly work? I would love to hear the outcome if you give it a try!